For a very small child a walk into the world is a walk into the wild: all is new and exciting. Every object, every sound, every shape provides a new experience. Consequently, he doesn’t know how to interpret what is happening. He doesn’t know how to hold an item or how to walk. That is beneficial, as he also doesn’t know about danger and, as a result, can freely explore the world around. Such an exploration cannot continue forever. If the child has to become independent of its protecting environment, he will have to know and understand, he will have to to act and he will have to deal with the world in a sensible way. It is the miracle of memory that helps us to overcome the state of ignorance. It converts the chaos of the wild into a world where we can organize the information and find our way. Thanks to the memory we find our way back to the place where the food is or other good things. Thanks to the memory we learn to avoid the danger. Thanks to the memory we recognize the past in the present. Thanks to successes and disappointments we learn how to deal with them. Life teaches us how to grow from recognition to understanding. The present is never equal to the past. There are always differences. Every street, every tree or every person that we meet is different from all streets, trees and persons we have seen before. How do we know that the new place where we find ourselves is a street anyway? 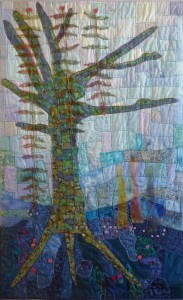 How do we know that the figure on the quilt is a tree? Or, how do we know that we know the person who is standing at the door? Even if she is our partner and we have lived with her for 37 years the question how we recognize her is intriguing. There may be just minor differences between what we see in the very moment and what we have left behind this morning and that is still in our memory. But, why are some differences minor while others major? How do we judge that? How do we know which differences are essential? In one way or the other we are able to judge that different observations refer to the same object we have seen before, or even, in the case we have never seen a particular object, we are able to recognize to which class of similar objects it belongs. The ability to judge the similarity between objects or events is called generalization. Given a few examples, sometimes even a single one, we are able to tell whether a new, unseen object belongs to the same group. Human beings are pattern recognizers, not just because of this ability, but especially because we are aware of it. We can handle it, teach the patterns to others and discuss both our observations as well as follow the arguments. The skill of generalization makes us conscious beings. It constitutes the basis of any science, in particular, the natural sciences. The question how we do this, how we come from observations to memory and to generalization is thereby the basic scientific question of pattern recognition. We will discuss it more in the future posts.